Last Christmas I received as a gift Fearne Cotton’s first cook book, Cook Happy, Cook Healthy, and it’s taken me so long to to get round to making something from it she’s only gone and released another one in the meantime! Before I rush out and buy her second book I thought I probably ought to make a thing or two from the first one. What I really love about this book is that it’s full of every day kind of food, not elaborate dishes that you’d only ever produce for a dinner party (which in my tiny flat really doesn’t happen often). Fearne is a well known advocate of an active and healthy lifestyle so I find her recipes are always soemthing I can make without feeling like I’ve over indulged. I chose to try out this recipe in particular as I was having a bit of a veggie craving and I’d recently whizzed up a batch of pesto so this was ideal. This recipe has re-introduced me to proper roasted beetroot. 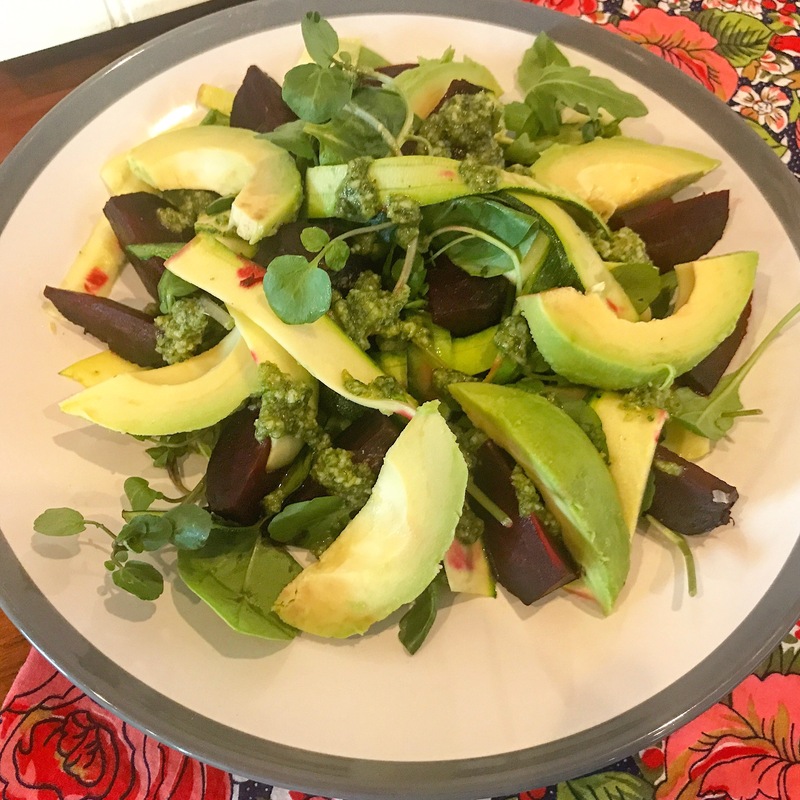 Beetroot is a fantastic ingredient and it’s so easy to pick up some ready cooked beetroot in the salad aisle and throw it into a dish to add a bit of sweetness and I do this fairly often. However, when you’ve bought raw beetroot and roasted it yourself, the ready cooked stuff suddenly seems so sweet and sickly. I still buy it, it’s a fantastic ingredient, but there’s something about the earthy flavour of a beetroot, that’s retained when it’s not been preserved in vinegar, that really does set it apart. Cook Happy, Cook Healthy by Fearne Cotton is available here.